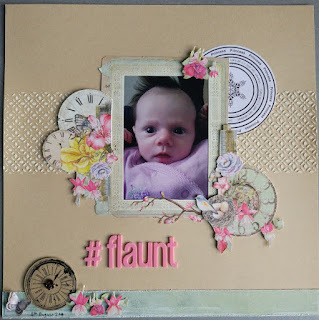 This month the challenge at Kraft + is to follow the sketch and add fussy cutting onto your layout. 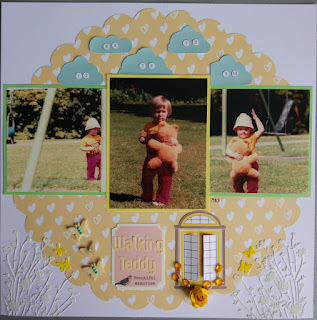 I don't often do fussy cutting, it takes time and a bit of skill, and something to cut out! I've had a piece of beautiful 49 and Market paper in my stash for almost a year now. So pretty but I never knew how to use it. When I saw this challenge I figured it out. I cut the frame from the middle of the paper and used that over the photo. I fussy cut the two bits on the sides of the frame and popped them up. I also cut out the rest of the flowers and leaves on the paper to add to the layout. 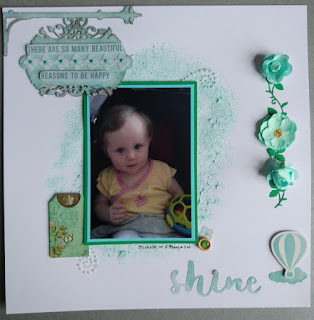 So much cutting but such a pretty layout of a wee cutie with her spiky hair. Oh this photo is adorable and I love your layout with the clocks and roses.. thanks for joining in with Kraft+ this month! Excellent job. I usually draw blood on my fiskar fussy cut scissors often spoiling my work if it was on white! Absolutely gorgeous. Love how you fussy cut that beautiful sheet of 49 Market paper. Well done on doing the bird too, so fine and precise. Love your work. Thank you so much for joining us at Kraft Plus this month.